The booth design for eyewear collective Lasnik Eyeworks from Austria unifies and integrates their independent sub-brands EYESHAKER, Seeoo Eyewear and Lasnik Fashion as well as the collaborating brands 13&9 Design and da27. 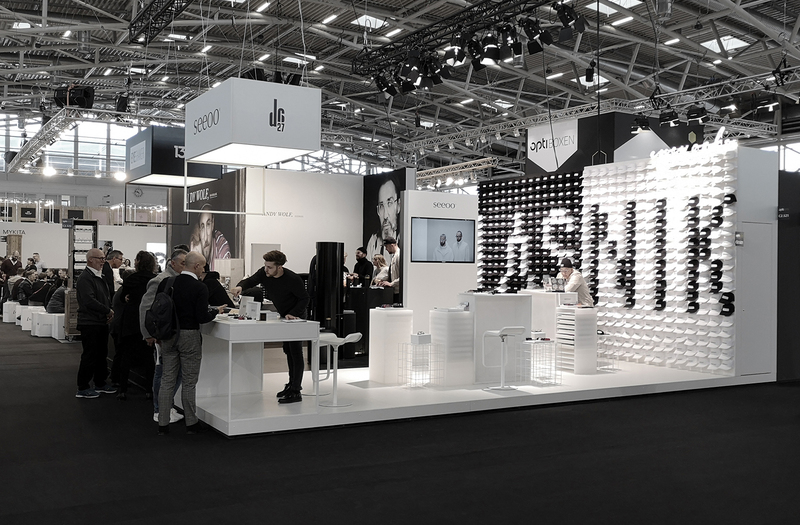 The stand design, introduced at opti 2019 in Munich, functionally zones the 50 square meters into branding, staging, and communicating spots with an overall black and white division. The stand´s back wall displays 600 black and white caps of the collective´s sub-brands, together making up the Lasnik Eyeworks logo and acting as a connecting link. The brand wall encourages people to interact and slowly dissolves as visitors take a cap from it, spreading the brands throughout the fair. In front of this backdrop, Eyeshaker and Seeoo are staged with a multitude of modular, flexible furniture, consistent with each brand. 13&9´s DIAMOND EYESHADES and JEWELRY from GEOMETRIC COLLECTION were both shown at Opti 2019 at Lasnik Eyeworks fair stand. Both series influenced by fashion and architecture, are a true metaphor of 13&9´s transdisciplinary work and holistic design approach.